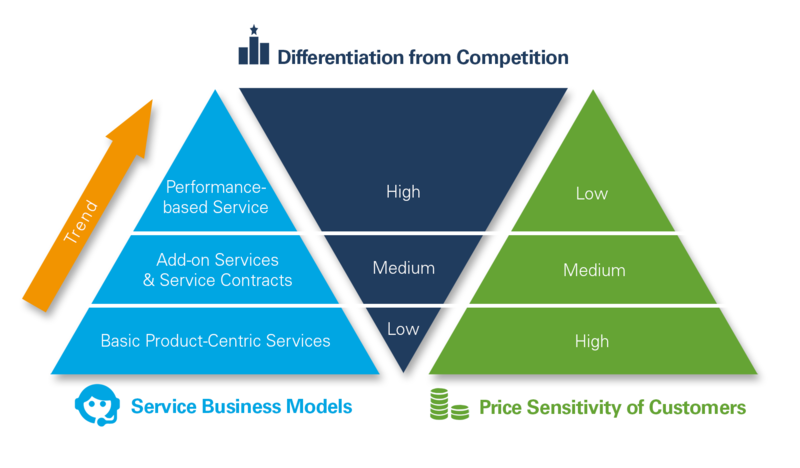 Don’t see service as a cost factor, but rather imagine each instance of service as a unique opportunity to impress your customers once more. Each service successfully provided is a step towards making these people loyal customers. You have a 360° customer profile and therefore a real-time overview of all customer interactions at all times, regardless of the channel via which these occur. What can we do for your service differentiation? Service is becoming an increasingly important factor for customers and is developing an identity. The customer can tell if you are acting in a customer-focused manner at all times and in every location or situation. This results in an opportunity to offer value added services to expand the own business and give the customer security. Nowadays, customers have a different awareness of service. Customers wish to be surprised with services that they had not expected over and over again. This includes the creation of innovative service offers and the continual optimal provision of existing services. Loyalty is generated through unique, individual experiences. Service can help here. Service enables you to adjust to the customer’s wishes in an individualistic manner and achieve customer satisfaction. Customer satisfaction is the first step to achieving loyalty, so it is a fundamental requirement. Compare yourself with the best in service. Stay a step ahead of customer expectations with SAP Hybris Cloud for Service. This cloud-based customer service software makes it easy to offer multiple service channels, access complete and contextual customer information, and gain real-time insight into call centre performance. SAP CRM offers a complete end-to-end solution for your service business and helps you to increase customer loyalty and to boost profitability. The integration of SAP CRM back-end and SAP Hybris Commerce allows customers to use the strength of SAP CRM functions with the best in class commerce solutions by Hybris. Several integration scenarios exists such as B2C, asynchrony B2B or complete integration of B2C and B2B. Rely on comprehensive omnichannel customer service – achieved with SAP Hybris software – so that your company can meet the expectations of its most demanding customers. Improve customer satisfaction and strengthen loyalty to make your entire organization more competitive. Enable contact center channels through phone, e-mail, chat, and SMS, while empowering agents to streamline processes and provide multichannel service excellence. Use SAP Ariba systems to implement efficient workflow management.